Breakfast in the Park is held each Sunday before Labor Day, the congregation gathers at the Stone Pavilion in Washington Park to share breakfast, old hymns, and fellowship. Sponsored and prepared by the Deacons, this event marks the beginning of another busy year at First Presbyterian Church. 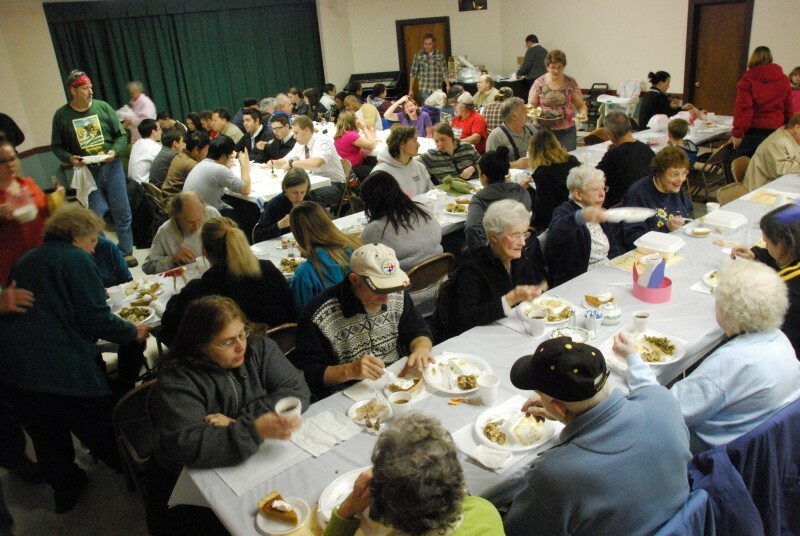 An annual meal served the Tuesday before Thanksgiving. It is a unique adventure in the life of the church. There are no committees. All is left to the good will of members, friends, and the movement of the spirit. Turkeys and all the trimmings are donated, with volunteers preparing and serving the dinner. Everyone in the community is invited, and guests from all stations and walks of life join us. In the past 20 years we have served 9,000 quests, averaging 450-500 people each year. Left over food is donated to the City Mission. This event is a rewarding prelude to the Advent Season. Equal Exchange is a worker cooperative that is an alternative for for-profit structured organizations based upon standard democratic principles. It is not designed to maximize profits, nor returns to investors, but rather to bring to the workplace many of the rights and responsibilities that we hold as citizens in our communities. It starts with farmers and ends with products such as coffee, chocolate, olive oil, etc. Equal Exchange products are sold in stores and churches. The goal is to provide farmers with a higher return on their crops. At First Presbyterian Church the Deacons sell Equal Exchange products. It is a national movement of young people working to fight hunger and poverty in their own communities around the time of the Super Bowl football game. In the weeks leading up to or on Super Bowl Sunday, young people take up a collection (many use a soup pot), asking for one dollar or one item of food for people in need. They give 100% of their donation directly to the local hunger-relief charity of their choice. Annually in the Fall and Spring musical performances are offered by a wide range of musicians from throughout the Greater Pittsburgh region. College Events - First Presbyterian Church sits adjacent to the campus of Washington & Jefferson College. We have had a close connection since the inception of both institutions in the 1700's. The church hosts a variety of college events through thte year in cluding honors convocation, lectures, musical and theater presentation. Plus many more local and international mission organizations including Habitat for Humanity, Washington County Gay Straight Alliance, Domestic Violence Services of Southwestern PA, Resurection Power, PERSAD, Covenant Network of Presbyterians, Washington County Outreach, Presbyterian Disaster Assistance, Medical Benevolence Foundation, and many more!